I was going to start an information series on Fruits like I’m doing for vegetables, but after realizing the enormous task I decided to limit myself to the fruits popular and grown in Japan. 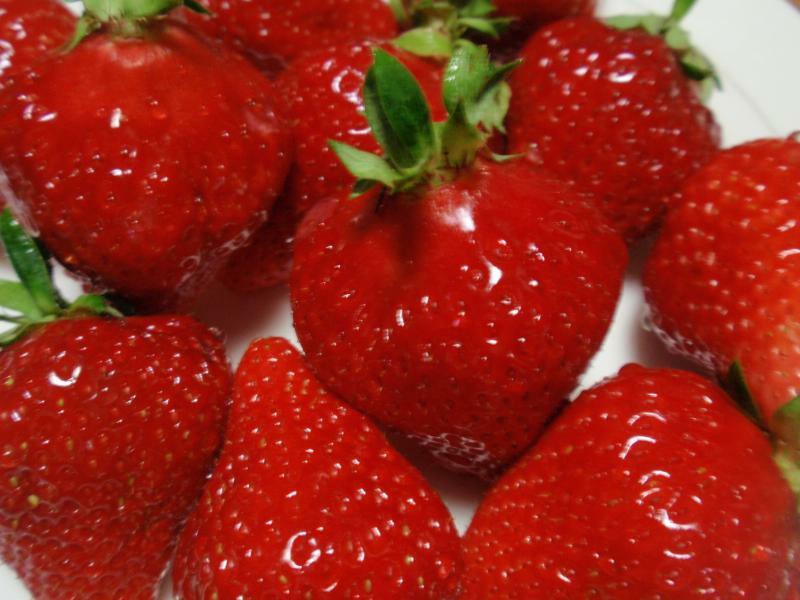 Why do I start with strawberries? 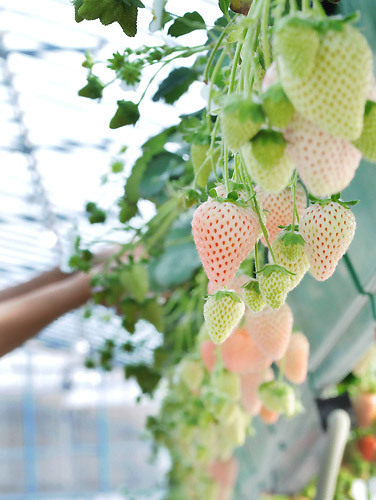 Shizuoka Prefecture with more 1,500 strawberry commercial growers officially registered is called “Ichigo no Ookoku/Strawberry Kigdom” in Japan! 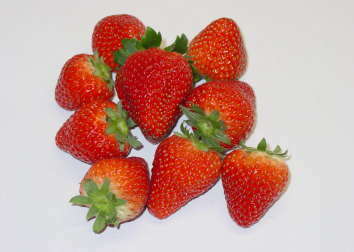 The garden strawberry is a common plant of the genus Fragaria which is cultivated worldwide for its fruit, the (common) strawberry. 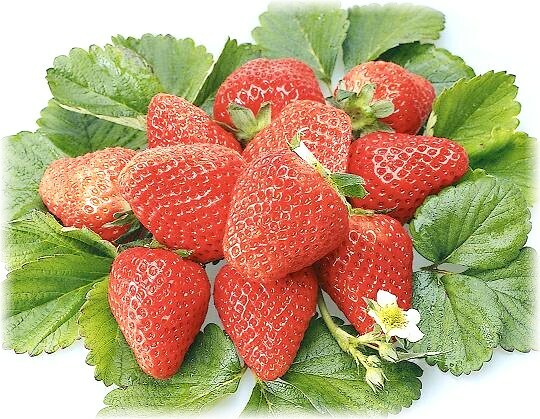 The fruit is widely appreciated, mainly for its characteristic aroma but also for its bright red color, and it is consumed in large quantities — either fresh, or in prepared foods such as preserves, fruit juice, pies, ice creams, milk shake, etc.. 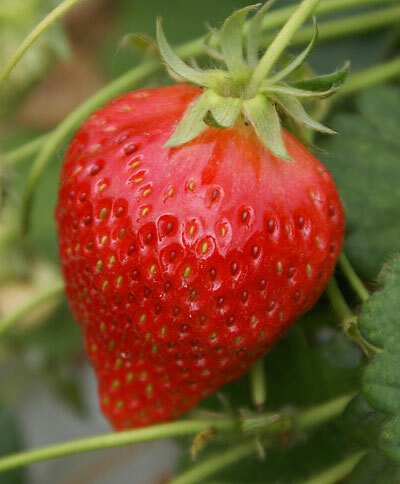 The garden strawberry was first bred in Bretagne/Brittany, France in 1740 via a cross of Fragaria virginiana from eastern North America , which was noted for its flavor, and Fragaria chiloensis from Chile and Argentina brought by Amédée-François Frézier, which was noted for its large size. 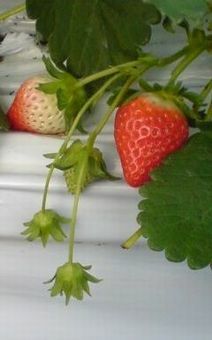 Cultivars of Fragaria × ananassa have replaced, in commercial production, the woodland strawberry, which was the first strawberry species cultivated in the early 17th century. For green house-cultivated, hydroponically or not, specimens the season is from December to April. -To preserve them, don’t wash them, cover themlightly with cellophane paper and keep them inthe vegetable compartment of your refrigerator. If you want to freeze them, get them rid of their leaves and stem first, then wash them and drain them thoroughly. -if you wish to wash them, leave them in clear cold water for 5 minutes. If you take the leaves and stem out before washing them, they will lose a lot of their vitamin C.
-Wherever possible, don’t take the leaves and stem out before eating them. 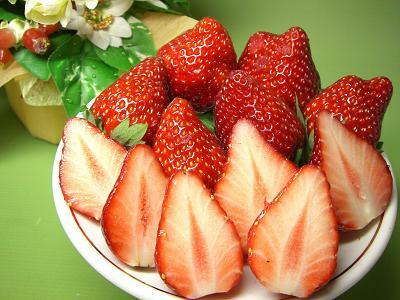 Strawberries in decoration cakes have lost large amounts of tehir beneficial elements! 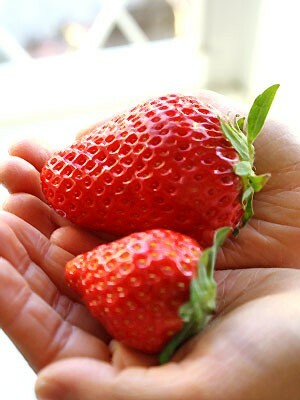 -Eat strawberries after drinking alcohol or when stressed! You will be surprised how much they help! 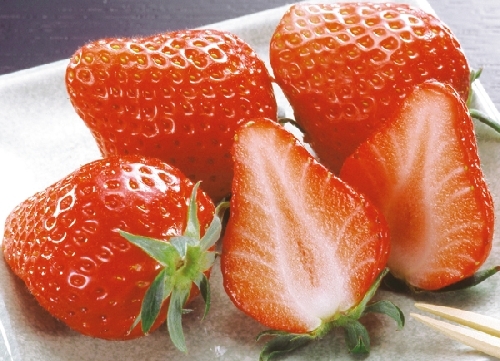 Although Japan was late in starting growing strawberries, they probably have the largest number of varieties! A recent cultivar developped in Shizuoka Prefecture! Really sweet, but with a striking balance with just enough acidity. Most of them go to Tokyo! From Fukuoka Prefecture. Sweet and a little acidity. From Tochigi Prefecture. Juicy. Cultivation has recently decreased. From Tochigi Prefecture. The most common in Japan. Very sweet. From Miyagi Prefecture. Round and refreshingly sweet. From Saga Prefecture. Extensively sold in Western Japan. Very sweet. Developped in 2006. 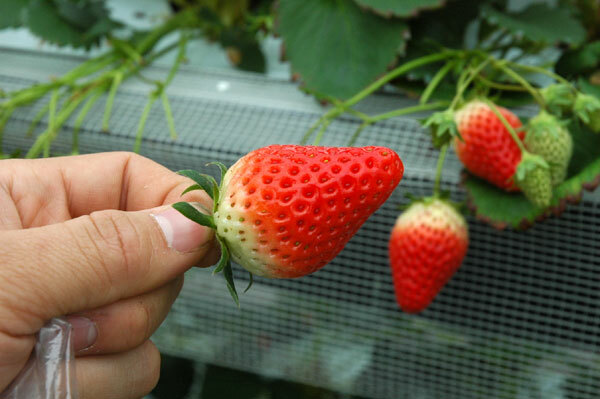 Probably the most expensive strawberry in the world. 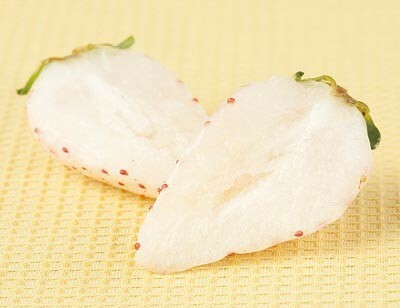 Its flesh is completely white while the skin is ivory with red seeds. 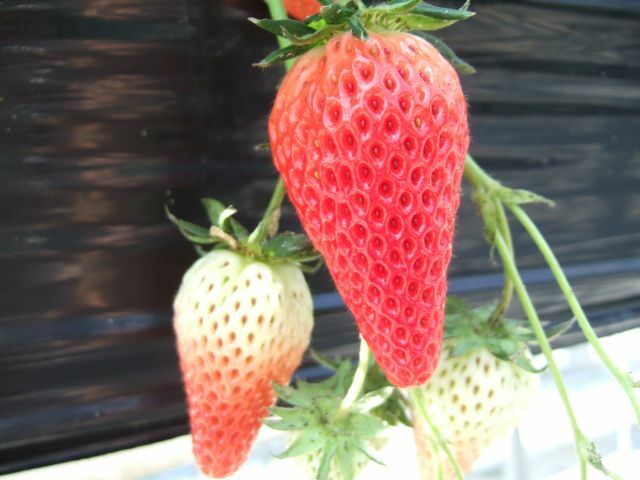 It is not an albino strawberry! But the taste is somewhat average. From Aichi Prefecture. High qaulity and expensive. Great balance. Red flesh. 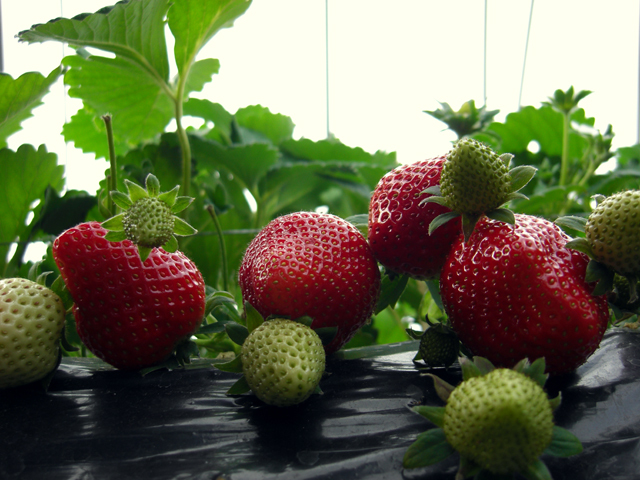 Very popular with “strawberry picking tours”. Very sweet. High in sugar. Popular for its high sun resistance. From Gunma Prefecture. Ver sweet. Especially available in December (in time for the celebrations!). From Kumamoto Prefecture. High in sugar, low acidity. Available from December, too! From Aichi Prefecture. Very juicy and great balance. 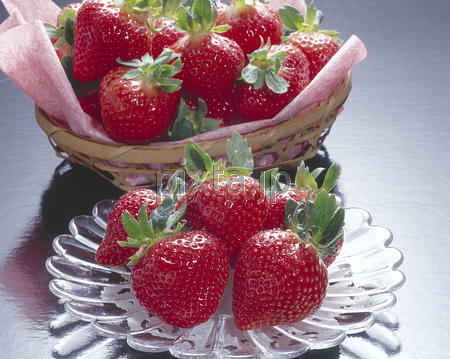 Strawberries contain a great amount of Vitamin C and flavonoids. 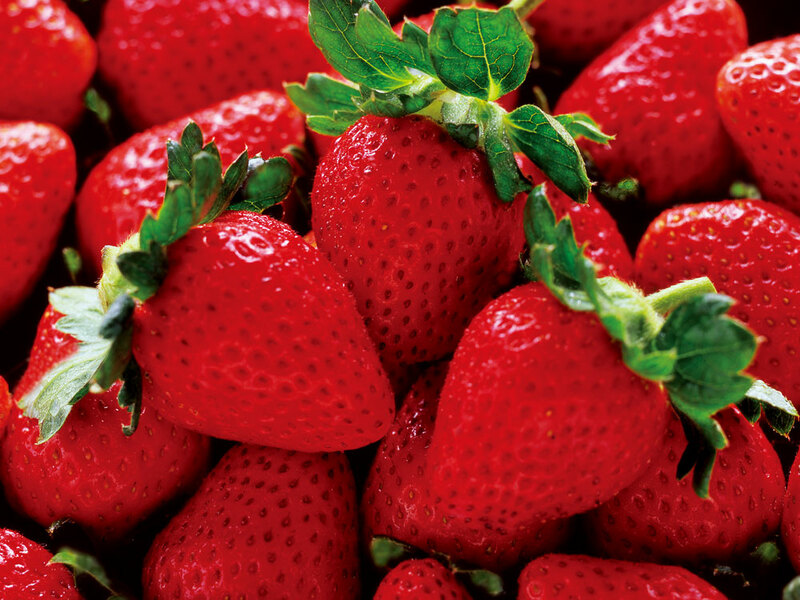 7 medium-sized strawberries contain enough Vitamin C for a whole day for an adult human! Thy also contain Vitamin B1, B2.and B6, Potassium, Calcium and Magnesium and a little iron. They also contain a lot of digestible vegetal fibers, helping digestion a lot. They also contain a lot of collagen, helping skin against blemishes! -Combined with yams, or yoghurt, or chickory, or shiso/perilla, helps strengthen the stomach, helps combat cancer and ageing. -Combined with broccoli, or pink gapefruit, or tomato, or red carrot, helps combat cancer, stress, and helps the skin and stimulates brain activity. -Combined with wakame seaweed, or onion, Judas’ era mushroom, or peanuts, helps prevent high blood pressure, heart diseases and blood vessels hardening.